"Regretfully, Gail's husband has reported her untimely death on September 1, 2013. 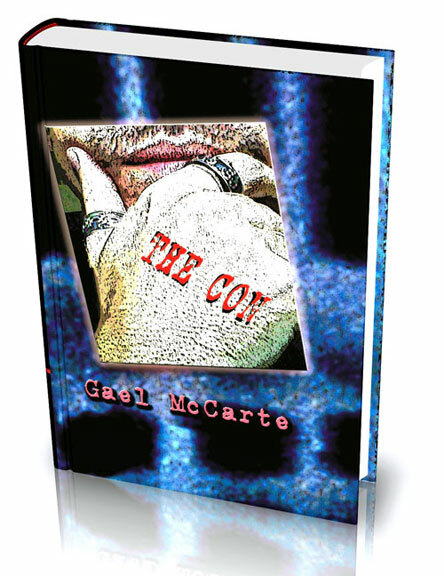 Gail's book, The Con, will be available on this site and others." As a psychologist with the Justice Department Gail Buesnel - writing as Gael McCarte - instigated a program titled Justice Through Art in Perth, Western Australia. The program assisted released offenders to continue their art with their "in the big house" teacher, using the same techniques. It was designed to be an independence maker, or even a wealth creator for the artists. They needed a storage closet and the Police had a spare one. The Police are not usually kindly disposed to helping long term prisoners but they painted the closet, transported and carried it up two flights of stairs. The room was donated in one of the loveliest historical buildings available, paints were donated, prisoners in prison made the frames and stretched the canvas. Gael had no mandate, no funding, no managerial direction, and no legislative precedence but she did it anyway. A local university took it on as a project and developed a web site to sell the art nationally and internationally. Prison art is a hot commodity. The arts community is one of the most inclusive and they accepted the artists. Accepted and selling the artists found a new life. Gael sees that many crimes are crimes of passion, anger, stupidity, impulse, trauma, mental illness and very few are caused by ingrained criminality. Gael believes that until each prisoner is adequately assessed and the cause of the crime discovered many re-offending cycles will not end. Here or in Australia. Internationally many countries are reviewing their practice of incarceration. Governor Deal is forward thinking in that different counties rent out prison space to others, trustees are used for highway landscaping and other work. Despite fierce opposition he continues these practices. Our prisons remain overcrowded and long termers find it difficult to re-orient into society, their skills are often outdated and no one will hire them. Gael postulates that using skills they learn in prison be they artistic or otherwise, is a way to provide them with their entrance to a crime free life. She sees a market here for prisoner art and tattoos. Even what are commonly called ?bad tattoos? if they were genuine prison tatts, would find a market. The Family Court in Perth displayed the paintings in its public areas for weeks. It was the first time the two arms of Justice had ever cooperated on any endeavor. The Court hosted a launch party and Gael whispered to one of the double murderers that he needed to address the Judge as ?Your Honor?, he whispered back, ?If there is one thing I have had practice with its talking to judges.? She later found him sobbing. He had never been addressed with such respect nor had he been accepted as an equal by judges, magistrates, attorneys and court staff. That program was fictionalized in the book, The Con. She fictionalized it as an overall business program that allowed a fictionalized artistic offender to open a tattoo parlor in the Peel area. He named the parlor ?The Con Artist?. To write with authority on a topic she knew nothing about she had to research tattoos, and now knows more about them than she would ever have thought necessary. The Con begins with a chat between Anna Lennox, psychologist from the department and her youngest son, Lachie. It wanders in and out of the cities and the Australian bush, the criminal mind and family life in Western Australia. It ends with a twist that leaves the reader saying "aaahhh she got me" and the reader will be smiling. In line with her support of prisoner education 10% of the profits will be given to Puppies Behind Bars where prisoners learn to train service dogs. These dogs assist law enforcement, veterans, children with needs and airport security. Some of the prisoners say they never knew they had anything worthwhile to contribute and to find out a dog they love, and who loves them. They train the dogs to bring hope to others. It blows their negative self concept. Some have never been in a home stable enough to have a pet. Not only are the lives of the recipients of the service animals changed, so are the prisoners. They finally have a purpose and a direction to make a valued contribution. An opportunity to succeed. Prisoners say ?I am training the dog, the dog is training me?it helped me become compassionate?I can succeed?you feel like a champion.? Aussie born Gael has many interests, writing, blogging, she writes for an ezine, she is a political junkie, dives in and out of genealogy and business. Her first novel was published December 2010, the sequel is almost finished and she has written another steampunk lite novel, loosely based on her Scottish ancestors in the 1850?s. It?s ready to go with 2 sequels planned. She is an award winning blogger. She has often spoken at seminars on a variety of topics. Wife, mother of 3, she has lived in Australia, England and the US and has traveled extensively here and abroad. 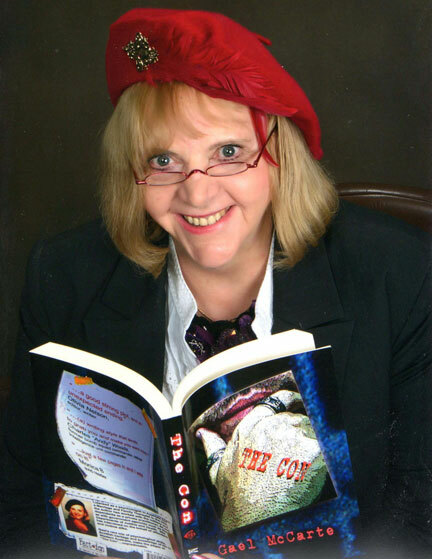 She is a story teller and uses humor and whimsy to lighten the drama of her tales. Gael writes under the name Gael McCarte to honor her Scots-Irish father. Her advice to writers is simple: ?Write?. She is now giving presentations on using social media for profit, fun and ministry. Many authors have been helped to build their platforms and connect with potential readers through these presentations. To read Gael McCarte's blog click here.